After wasting a weekend being ill last week I managed to have a good go on the extension this weekend. 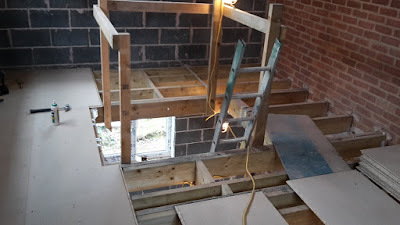 I'd ripped up the temporary flooring a couple of weekends ago (some ply I'd bought cheap) and the upstairs was ready for having the chipboard put down. An easy enough job - but not very kind on your knees! 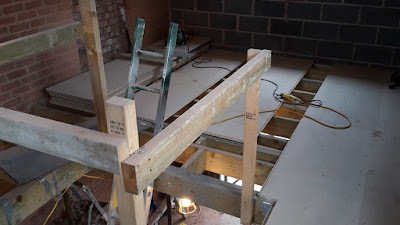 I glue all the joints and I glue the boards down to the joist as well as using screws to hold them down, I hate hearing squeaking floorboards so I go with a full belt and braces approach. I've still left the hatch in the floor, which will be filled in as the upstairs gets finished, this means that I can now build the walls and get the whole bathroom ready before we knock through into the old bathroom. I also pulled in the chimney liner with the help of a friend. This is a bit of a mess around as I need to insulate it before the scaffold comes down. 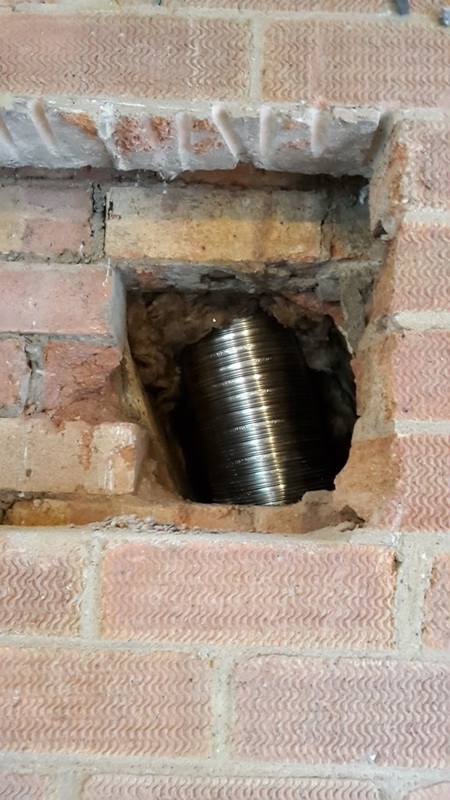 Trouble is I don't want to build out the fireplace yet (as it'll wreck our dinning room) so I can't terminate the flue where it is to finish. Instead I've wedged non flammable/combustible around the flue where I've broken out the chimney higher up. Then when I come to make the bottom section of the fire place I'll be able to insulate the last bit from inside. The down side to this was I didn't have enough insulation to finish insulating the flue, I was gutted, it's hard to work out what you'll need anyway as the dark depths of a chimney are unknown in size, I was about a bag short which I'll pick up in the week, just annoying not to finish the job I started! Because the two counties where we live/the wife works have had different half terms, my wife is off next week doing all my jobs (school run etc) and I'll be working on the extension as well as a few little jobs for customers. This means I have a huge list of jobs to get through including, nogging out the floor and ceiling joist, finish the flue, install loft hatch, plasterboard the ceiling up upstairs, stud walls up for the bathroom/wardrobes/cupboards and plasterboard them one side. Should be a busy week hopefully! It's a good feeling when the floor goes in! It must be getting exciting seeing it all come together now. One of these days you are going to have to take a break and just sit under a tree by a river with a good pipe. You work pretty hard.